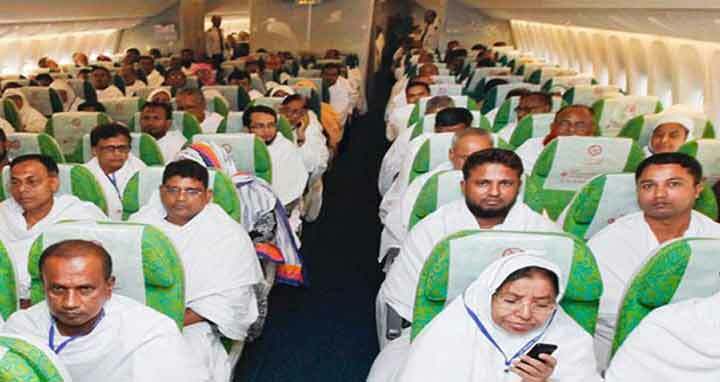 Dhaka, 26 Feb, Abnews: A total of 1,27,198 pilgrims would perform holy Hajj from Bangladesh this year as the cabinet today approved the drafts of the "National Hajj and Umrah Policy-2018" and the "Hajj Package- 2018". The approval was given in the weekly meeting of the cabinet held at the Prime Minister's Office with Prime Minister Sheikh Hasina in the chair. Cabinet Secretary Mohammad Shafiul Alam said this while briefing reporters at Bangladesh Secretariat in the afternoon. Under the Hajj Package-2018, he said, a total of 1,20,000 pilgrims would perform Hajj in private management, while the number under government management would be 7,198. In the first package of the government arrangement, a pilgrim would cost Tk 3,97,929 and in the second package the cost will be Tk 3,31,359. The minimum cost excluding house rent for a pilgrim who would perform Hajj under private arrangement has been fixed at Taka 1,68,277. The cabinet secretary said all pilgrims will have to carry machine readable passports for performing Hajj this year. A Hajj agency could send a highest 300 and minimum 150 pilgrims from Bangladesh, he said adding, an aircraft can carry the pilgrims of three Hajj agencies and three Moallems. The pilgrims under the private management will have to pay money for qurbani (sacrificing animal) through the coupon of Islamic Development Bank in Saudi Arabia. The cabinet secretary said every person willing to perform Hajj will have to make pre-registration through online, which would be synchronised with the central NID database. Later, they will have to complete registration process to get pilgrim ID, he said, adding that the registration would remain valid for two years. Alam mentioned that police verification for the Hajj pilgrims would not be required as such process was done during issuance of passports. He said the expatriate Bangladeshis could make pre-registration using their passports instead of NID. The cabinet secretary said that once the registration is completed, registered pilgrims could not be replaced by others. However, he said, replacement could be made in case of death or complicated ailment of any registered pilgrim, and added that it could not be more than four percent of the registered ones. About the increase of air fare, Religious Affairs Secretary Anisur Rahman said the fare has been increased following the rise of jet fuel price, devaluation of taka against dollar and for some other reasons. The cabinet secretary said like the previous years, the Hajj pilgrims under both government and private management will have to pay additional one percent money as house rent. He said the religious affairs ministry will pay Tk 1520 (68 Saudi Riyals) to the Saudi Hajj Ministry as a bank guarantee on behalf of a government Hajj pilgrim, while the money will be paid the Hajj agency concerned for a Hajj pilgrim who will perform Hajj under private management. Alam said the pilgrims who will stay over two kilometres away from Makkah will get transportation facilities. He said those who performed Hajj in the last three years from 2015 and who got Hajj visas during the period but didn't perform Hajj will have to pay additional 2100 Riyals for performing Hajj this year. The cabinet secretary said one guide will go to Saudi Arabia for every 45 pilgrims and information regarding the guides for every year will have to make entry to Hajj Management Information System after filling their forms two months before commencement of the Hajj flight from Bangladesh.